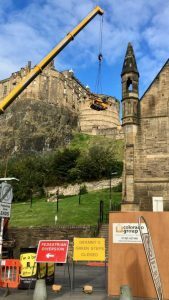 Colorado Construction - How to get a Piling Rig in to the back Venal of the Grassmarket? 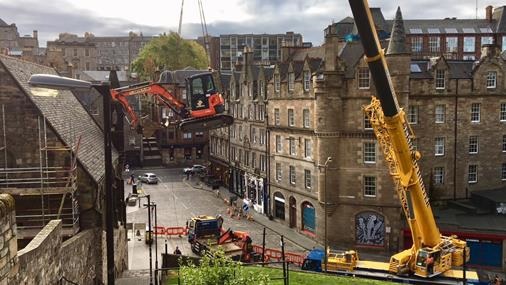 How to get a Piling Rig in to the back Venal of the Grassmarket? Read the Newsletter – November 17. 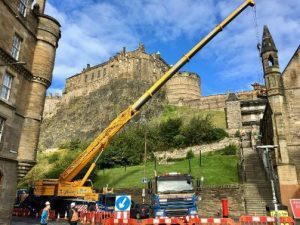 A challenge overcome at the Grassmarket works this month was to get a 8ft x 9ft Rig, weighing 8.2T in to the back of the site – It could not be driven in due to the location of the site and the drop of level within the site. Having started the works in August the planning for the lift was already under way with meetings being held with CEC Roads department and Crane Hire Companies. Following discussions, Bernard Hunter Crane Hire were employed to carry out a Contract Lift. A Lifting and a delivery schedule produced, due to amount of plant & material to be craned in to avoid traffic issues and the day was set – Sunday 8th October. Works was completed and the area returned to normal Sunday afternoon use by mid-afternoon with no public issue or complaint. Thanks go to all the lads involved for a job well done!